Ohhhh, goodness! I know everyone says it, but I can’t believe it’s a new year already. Wow, that was fast. Since there were lots of kids at the party, and since my husband has to work at 3am, even on New Year’s Day sometimes, we were home early…and then my older kids tortured me by staying up until actual midnight. Who does that?? And they were all, “Mom, are we gonna have some sparkling cider or something?” and I was all “Yeah. Maybe next Tuesday. Lemme sleep,” and then someone elbowed me at midnight and we all stumbled up to bed. It was magical. So the next day, when I was actually awake, I did some looking back over the year. And I looked up the most popular recipes from my site over the past year, and I’m happy to say they’re some of my favorites! Since I also started writing for the BabyCenter Blog in 2015, I included a few great recipes from there as well. This was a fun exercise — most of these are ones we make often, but I found a few old favorites that I haven’t made in a while. I’ll need to bring them out soon again. 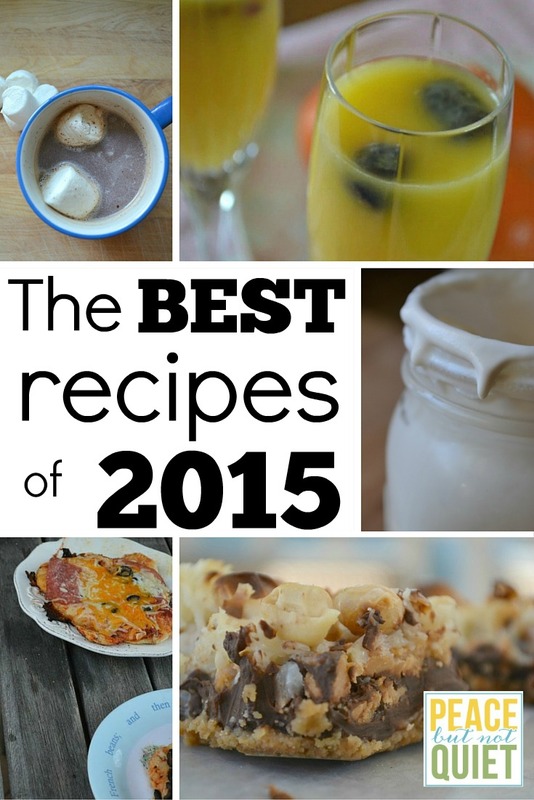 So, without further ado, the best recipes of 2015! This is one of my favorites (I know, I said that about all of them. But hear me out on this one). It’s got a lot of good flavor in it, and it’s really crazy-simple. Throw everything in the slow cooker first thing in the morning, dish it out at dinner, maybe with a few tortillas and avocados on the side, and it’s a really amazing wowzer kinda meal that tastes like it took a lot more work. Always. For Christmas morning, and Thanksgiving morning, and New Year’s Day, and baby showers when the mom-to-be can’t imbibe, and all the other showers where someone might want something non alcoholic. It’s light and citrusy and sparkly and feels all fancy. I just made these last night. You don’t mix anything in a bowl, just layer everything on top of each other and toss it in the oven. Make sure you allow enough time for them to cool and harden a bit, and in the summer keep them in the fridge until you want to eat them and they’ll be nice and cold and sweet. Ahhhh! We’re hot chocolate suckers. If we have the patience to doctor ours up before we drink it, this is what we do. Right about this time every year, I need a jolt out of my rut. After school snacks have become an afterthought, and I need this list to remind me that with a few minutes of effort, the kids can have something fun and healthy when they get home. I’m going through the list again as soon as they start back after break. Erm, not that I’m counting down or anything. 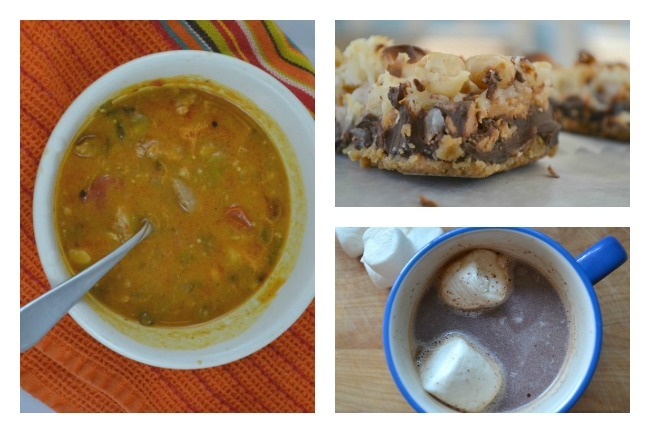 Delicious on pies and in hot chocolate, but more importantly — fun to make! Get your wiggly kids moving with this one. I had this every day for a week last fall, and then…where did it go? I need it in my life again. My New Year’s resolution is to eat more camembert grilled cheese. When our kids have slumber parties, we almost always have these for dinner. 1.) They keep everyone occupied and I don’t have to plan an activity for them for a while and 2.) At the end, we all have food. And kids love making pizza. Actually, everyone I know loves making pizza. My husband started this Saturday morning tradition. It’s simple, but the kids are thrilled to serve themselves, and the cleanup is easy, and it teaches them good skills in pouring and scooping and things. Now they just need to master the skill of Making Mom Her Coffee. Another great one to pop in the slow cooker in the morning and enjoy for dinner. Warm, wintry comfort food! Here’s to a delightful, wonderful 2016! I’m so glad you’re a part of my life and my small corner of the internet. It means more to me than I can express. Thank you for being here.